Wind and water erosion in East Gippsland. There are a number of issues in the region that affect soils and natural resources. See Soils of East Gippsland for information on soil types. Tunnel erosion is initiated when water infiltrates through to the subsoil via cracks and surface depressions or follows paths left by rotted tree stumps and grass roots. In the advanced stage of tunnel development, it is usually quite easy to see chain tunnels, soil cracks, tree stumps and depressions in the land surface. However, the evidence of flow paths left by decayed grass roots is not so obvious at the land surface. A combination of mechanical, chemical and vegetative measures can be used to destroy existing tunnels, limit overland flow, promote relatively even infiltration and increase the concentration on the clay complex, especially in dispersive subsoils. Mechanical techniques where appropriate, include the construction of banks, gully checks and terraces, which are intended to impede runoff. Deep ripping, chisel ploughing and other types of cultivation promote more even infiltration by rupturing the often hard-set, slowly permeable, surface soil. The tunnel floor often characterized by low permeability so that deep ripping, is used to break-up the flow paths where tunnels are of a similar depth to the tynes. Where possible, very deep tunnels should be dug out and re-compacted. 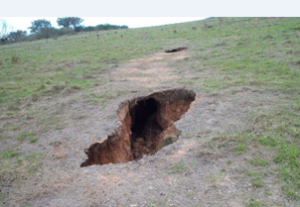 Significant damage to soils in Gippsland has occurred when groundcover has been removed and is no longer available to protect soils from wind and water erosion. This occurs mainly in dry times but particularly in pastures with a high proportion of annual species like sub-clover or capeweed. When annual species die out in spring they leave significant areas of bare ground during summer and autumn. Pastures which are continuously grazed are most susceptible unless practices are put in place to destock when groundcover falls below critical levels. North east Victoria is particularly susceptible to erosion during major flooding events. Rainfall entering waterways from alpine regions can very quickly result in rivers and streams consuming agricultural land, often damaging pastures and leaving behind significant areas of erosion events. For further information see I want to manage ground cover. The majority of soils in this region are strongly acidic (pH 4.3 – 4.8 CaCl2). Soils with a low pH (less than pH 5) result in chemical imbalances such as aluminium toxicity and deficiencies of phosphorus and trace elements such as calcium and molybdenum. Pasture production is reduced as the aluminium and manganese levels associated with acid soils become toxic and retards root growth. The availability of essential plant nutrients such as phosphorus and molybdenum also reduce pasture growth. These soils require the application of lime to establish acid sensitive pastures such as phalaris and lucerne and to maintain production (see soil pH map of Victoria). Very low pH (less than pH 4) leads to soil physical breakdown where the clay structure of the soil is broken down. Acid soils also impact on soil biota, reducing earthworm numbers and making Rhizobia less effective. In addition to the loss of production, soil acidification can lead to increased runoff, erosion, reduced water uptake, salinity and increased nitrate leaching. Further information on monitoring and managing soil pH is provided here. Pugging – when cattle are left on pastures for too long. Waterlogging occurs when water enters the soil faster than it can be utilized or drain away. It is often associated with impermeable clay sub soil in low lying areas and an annual rainfall that exceeds 600mm. 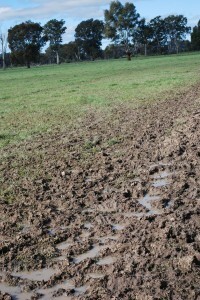 Waterlogged soils remain colder for longer which slows pasture growth in the spring months. The anaerobic environment created by waterlogging can cause nitrogen loss though de-nitrification and leaching of potassium, sulphur and nitrogen through the soil profile, as well as a decline in favourable biological activity, which assists in the restoration of soil structure decline. Soil structure decline impedes the movement of water, air and nutrients through the soil profile. A decline in soil structure can lead to waterlogging and surface runoff which can cause erosion and an increase of sediments entering the waterway. Sodosols (ESP > 6%) are more prone to soil structural decline, as clay particles disperse when the soil is wet, blocking pores and reducing air and water movement. These soils tend to form a crust on the soil surface when dry, which can impact seed germination and increase surface runoff. Pasture establishment in these soils may require gypsum to reduce the crusting of the soil surface to allow germination of pasture seedlings. Soils low in organic matter are susceptible to slaking. When rainfall hits dry soil it can cause the aggregates to breakdown into smaller particles that block pore spaces and can cause the surface to seal. Cultivating the soil reduces organic matter levels. In a grazing system organic matter levels on your soil test should be greater than 2% to prevent slaking. It is important to maintain groundcover even in prolong dry periods, as the slaking can occur on dry, bare soil, especially if heavy rains coincide with the autumn break. The clearing of deep rooted native vegetation and replacing with shallow rooted pasture species has changed the water balance which has resulted in salinity. There are saline areas in the Bengworden area that are result of saline discharge. Early signs of salinity such as reduced vigour and stunting of improved pastures is hard to distinguish and may go unnoticed or misdiagnosed. Salt sensitive species such as clover begin to thin out and replaced with salt tolerant species such as sea barley grass and spiny rush. Soluble salts contain high levels of sodium and chloride which is toxic to plant species such as sub clover and lucerne. Waterlogging is common around discharge sites which reduce plant growth. Other impacts include water quality decline due in increase salt loading in waterways and death of existing native vegetation. Management decisions to combat salinity included a combination of deep rooted perennial pastures with high density tree planting in recharge areas. Biodiversity has been lost from the landscape with the clearing of native vegetation for agriculture. In East Gippsland native grasses on steep hills are valued by landholders resulting in 22% of the area retaining a predominantly native grass base. In the high rainfall areas blackberry has invaded many waterways and steep terrain which can have an impact on the native grasses and production in these areas. See I want to improve production of native pastures and identifying native grasses for further information. The rivers of East Gippsland are remarkable natural assets of the entire Victorian community as they are seen to be in pristine condition (East Gippsland CMA RCS). 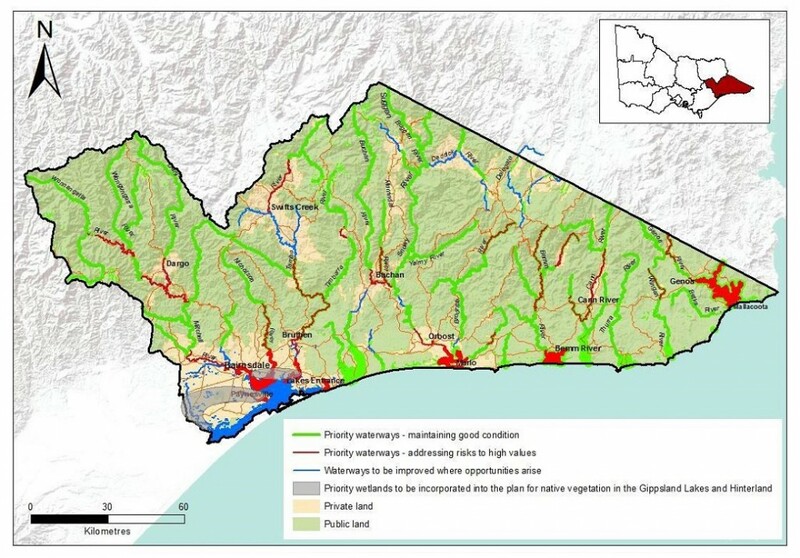 Six heritage rivers are located within the East Gippsland basins, several catchments are almost totally free of human disturbance, and East Gippsland has a much higher proportion of streams in ‘Excellent’ or ‘Good’ condition, defined using the Index of Stream Condition Assessment (DSE, 2005), than the rest of the state. The Mitchell River is one of only two ‘iconic’ river systems in the state recognised in the Victorian River Health Strategy. A number of East Gippsland rivers drain into the internationally significant Gippsland Lakes system. Many of the rivers in the east of the region are classified as either in ‘near pristine’ or ‘largely unmodified’ condition. 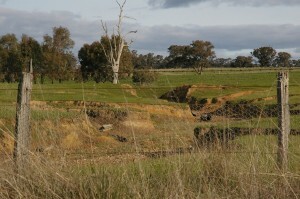 Some of the waterways along the Snowy, Tambo and Mitchell Rivers run through cleared land and do require protection to retain the high values of these waterways. Fencing off waterways from livestock and restoring riparian vegetation will assist in retaining the quality of the waterway.